Kryshe’s stunning In Between EP and Slow Dancing Society’s The Cogent Sea album and The Dusk Recital EP have landed in Igloo Magazine’s Best of 2014 list. All three releases received glowing reviews at Igloo during 2014 thanks to the wonderful Nocturnal Ghost. Check out the list and review links here and listen to more Kryshe here and more Slow dancing Society here. 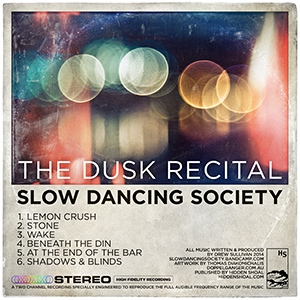 Pledge and Get Slow Dancing Society’s “The Dusk Recital” on Vinyl!